Paris, 21 November 2018 – In order to support the development of the innovative river shuttle project “GREEN DELIRIVER”, the global engineering group SEGULA Technologies has today signed an agreement with GRDF and seven other partners – Chantier Naval de la Seine et Oise, Communauté urbaine Grand Paris Seine & Oise (GPS&O), Saint-Gobain Distribution Bâtiment France, Syctom (regional authority for household waste management), TOTAL MARKETING SERVICES, HAROPA Port de Paris and Voies navigables de France (VNF). Signed on the occasion of the Salon des Maires de France (French Mayoral Exhibition), the objective of this agreement is to finalise a pilot riverboat by the year 2020. Against the backdrop of a booming e-commerce industry and heavily congested road networks, the Research & Innovation teams at SEGULA Technologies initially developed an urban logistics concept in partnership with GPS&O and GRDF that makes use of the inland waterways network to transport goods from the outskirts of Paris directly into the city centre, via the River Seine. On its return journey, the shuttle boat removes the city’s waste for onward transport to waste processing and recycling centres. River transport provides an effective solution by introducing short supply chains to cover city centres and to reduce the impact of transport. GREEN DELIRIVER uses a silent hybrid propulsion system powered by biogas and electricity in order to reduce air pollution emissions and help to improve air quality. This shuttle boat will rely on CNG (Compressed Natural Gas) stations located along the length of the river and supplied with natural gas from the GRDF-operated network. GREEN DELIRIVER includes an efficient goods management solution that uses an onboard warehouse. This connected warehouse optimises supply chain performance by maximising load volumes and using rapid load-handling systems. Last-mile delivery will utilise solutions with low impact on traffic flow in city centres and on the environment. The innovative project is rooted in the local area of the Communauté urbaine Grand Paris Seine & Oise and will create jobs, not just in the construction of the riverboats, but mainly during the project’s operational phase. By way of this agreement, SEGULA Technologies, GRDF, Chantier Naval de la Seine et Oise, GPS&O, HAROPA, Saint-Gobain Distribution Bâtiment France, Syctom, TOTAL and VNF will join forces to build a comprehensive solution that is fit for the new challenges of urban logistics. This brand-new consortium brings together various value chain stakeholders with expertise ranging from clean energy production, to energy distribution, to the design and manufacture of the riverboats, and also the operational aspect. The project also involves the public bodies in charge of regional development and river transport, and in doing so demonstrates the societal value of a solution that promotes the development of a circular economy. “Co-creation is at the very core of the GREEN DELIRIVER project. Since its initial design by the SEGULA Technologies Research and Innovation teams, we have aimed to bring together as many stakeholders as possible in order to ensure the success of the Green Deliriver project development. This project encompasses a number of industrial themes – areas that our Group has been focussing on for a number of years, such as naval architecture, energy efficiency, new materials and new energies, not forgetting mobility for the future”, states Nicolas Chantrenne, Manager Director (France) of SEGULA Technologies. “GRDF is working alongside SEGULA Technologies on its research into innovative and environmentally-friendly solutions for sustainable mobility. 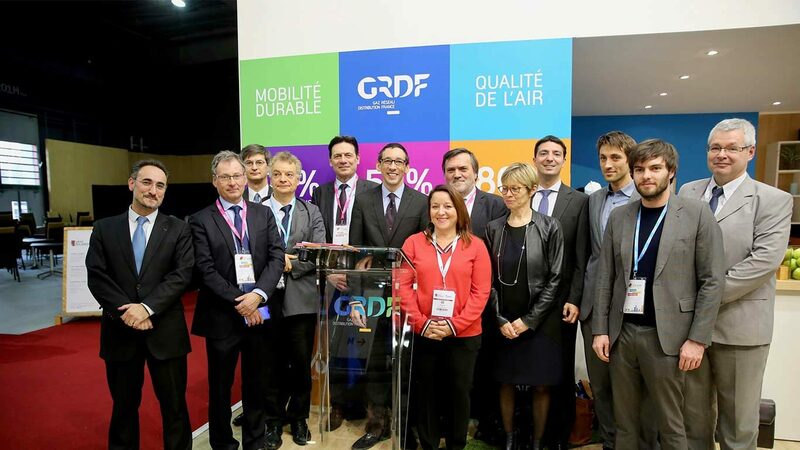 As part of its commitment to energy transition, GRDF aims to support the growth dynamic of the VNG and bioVNG sector, which it sees as one of the most effective solutions to the challenges of future mobility and allows for rapid improvements in air quality. VNG and bioVNG offer a solution for authorities and businesses aiming to meet the objective of 10% renewable energies in transport by 2020, as set by the French Law on Energy Transition for Green Growth, by helping to embed a circular economy at regional level. ”, says Edouard Sauvage, Managing Director of GRDF.